Elima-Matic® E6 1/4″ AODD Pumps are the latest addition to Versa-Matic’s line of plastic pumps. Get reliable performance with the non-stalling, lube-free air valve system in all Elima-Matic® E6 1/4″ AODD pumps. 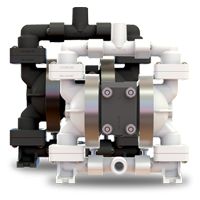 Leak-free design reduces downtime, ensuring continuous, reliable pump performance. Inlet and Outlet	0.25" NPTF I.D. Click here for E6 detailed specifications.